We’ve been trying to keep up with two zucchini plants all summer… zucchini bread galore, catch them before you have a softball bat on your hands, you know the drill. 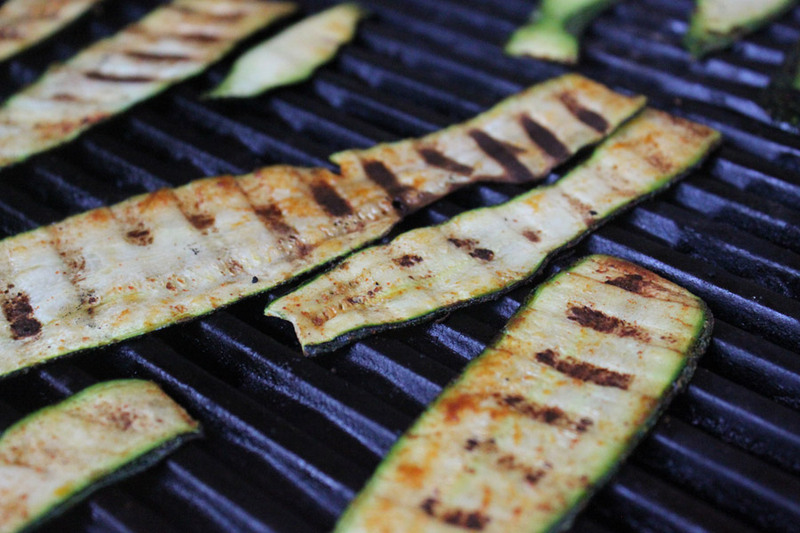 My friends Lark and Dan had served thin-sliced zucchini straight off the bar-b-que and sprinkled with smoked salt at a backyard dinner party last summer, and it was the inspiration for my Zucchini Bacon. From the grill with love. First off, let me assure you, it is more baconesque in shape than flavor, though with some smoked paprika and smoked salt, it does get into the salty savory neighborhood. The way to make it is to slice the squash into 1/16″ ribbons on a mandoline, and then just toss them with the above spices plus some olive oil. They take 2 or 3 minutes on the first side, and another minute or so on the other side. Pull them off the grill before they get too crispy, though the thin areas will start to brown nicely. It wasn’t a huge hit with the kids, but it is nice because it is sliced so thin that most of the moisture evaporates out. The thing I’ve been using them on is sandwiches; it’s a nice additional flavor to a regular turkey or cheese sandwich. So there you have it… more bacon for you.